While the Terriers prepared for Sunday afternoon’s game at Quinnipiac, BU’s Hockey East rivals were in action: UNH edged Lowell, 4-3; Maine beat UConn in overtime, 4-3; Providence beat Miami, 3-1; Northeastern thumped Sacred Heart, 7-3. And in Chestnut Hill, BC and Quinnipiac played to a 1-1 overtime draw. ►Sunday’s BU-Quinnipiac game will be available on ESPN3. 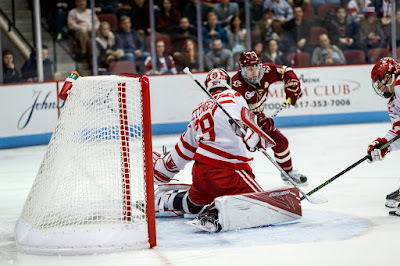 ►CHN’s Joe Meloni writes that, on a talented Terrier team, a strong season from sophomore goalie Jake Oettinger is the key ingredient that can result in winning hardware and going deep into the post-season. 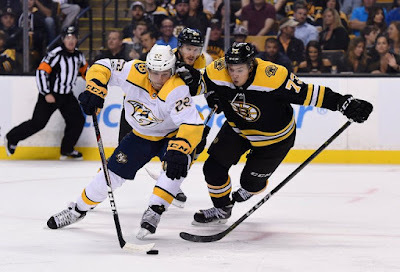 ►As a group, the Terriers attended Thursday night’s Bruins opener with Matt Grzelcyk and Charlie McAvoy skating on the Bruins blueline. ● The New York Times reported on Charlie McAvoy’s first regular-season game and his path to the NHL, quoting Coach David Quinn, Jordan Greenway and Ryan Cloonan. Terriers dropped a 3-2 overtime decision to #8 Northeastern at Agganis Arena. Freshmen Nara Elia and Kristina Schuler had given BU a 2-0 lead, but the Huskies knotted the score in the second period and then scored the winner at 2:21 of the extra session. The teams meet again today at Matthews Arena with puck drop at 2 p.m.
Schuler scored the only first period goal, a power play tally, assisted by junior Reagan Rust and redshirt sophomore Abbey Stanley. Elia’s goal midway through the second period, also on the power play (with assists to Schuler and Stanley), doubled the lead. But Northeastern responded just 19 seconds later to make it 2-1 and scored again with 1:32 left in the period. After a scoreless third, the Huskies’ Matt Hartman beat goalie Erin O’Neil for the game-winner. O’Neil made 32 saves for BU.